We work in design & engineering of composite parts and also create exploded views, diagrams & owners manuals for several industries. Northwing is one of our 'fun' clients. We've been working side by side with Kamron Blevins to develop a 912 trike that fits the budget, exceeds expectations & lacks the outrageous international exchange rates and shipping fees. I'd say we've done it. Backcountry Aerosports has already taken delivery of, and sold the first 5 Apache 912's and one 912-S. Two have been outfitted & thoroughly tested on floats. Another is the first IFR trike ever with full LCD instrumentation by Dynon, Transponder, ELT, and much more... More on that if you want to call & yak about it. The dual-mast design, dual rear hydraulic brakes(no more skidding rocks into your prop), the 2 largest pilot & passenger seats in the industry (2-3 hours of comfort easily), standard wide tires & wheels, full (I mean FULL) fairing with functional air induction, storage & rigid construction. I weigh 200lbs and have stood on the floor of these fairings with no damage. All the 912's will deliver with standard Instructional Package, standard with Assisted Lift System for Mast/Wing and full instrumentation. I'm really impressed with how far Northwing has come with both innovation & reliability in the just the last 3 years. Kamron also has something else in the hangar that will rock the wing market. The new GT5 wing is something to try if you have a chance. Huge speed range and very approachable even for intermediate pilots seeking their change to a xcountry wing. 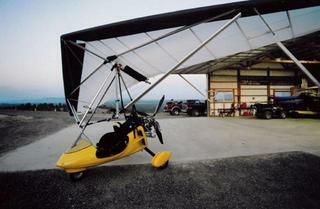 I have flown this wing on 3 different trikes and even on my Tanarg for 3 months. I have seen 92mph in level flight with a 26mph landing in calm conditions. This wing with the 912 would be the best xc machine on the market in the $35 - 45K range. You just can't attempt to match the Northwing 912 without spending another $9200 or more for an import. And, they're right here in the US doing everything they can to keep you happy. Call us if we can help you further - 509.990.5060.